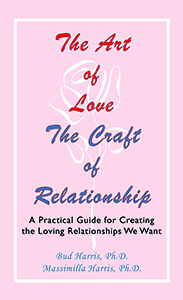 The Art of Love: The Craft of Relationship presents the profound principles that form a loving relationship in an easily accessible manner. Using a deceptively simple approach, it will help people shift their attitudes and provide them with skills to create a loving, long-lasting partnership. There are so many titles in print on change because it is an ongoing challenge for most of us. So are relationships. With many years of experience working with couples, Bud and Massimilla Harris share vital information, lessons, and insights. Engaging, and easy to read, The Art of Love: The Craft of Relationship is packed with wisdom, skills, and ideas that can open the door to a new era of fulfilling relationships. This Fisher King Press publication brings complex material and common sense into a format that is carefully constructed to achieve results by being communicative and consistent, enjoyable and hopeful. Unlike the textbook appearance of many self-help books that include psychological jargon, case examples and exercises, The Art of Love: The Craft of Relationship uses stories and dialogue to teach valuable skills for handling problems in a way that builds love and trust. Singles and couples who seek self-improvement, who want to enrich their relationships, and who desire practical advice for helping love and trust grow. Singles who are frustrated with their current relationships or have difficulty staying in long-term relationships, and who want to find and develop a more supportive and interactive partnership. Couples who need to learn how to understand each other better in order to have their uniqueness affirmed without threatening their relationship. Couples who are experiencing relational difficulties and who need to improve their communication with each other and learn how to handle conflicts in a way that brings them closer together. Divorced individuals who need support in understanding why their marriages failed and who need encouragement in seeking to get their needs met again. People who are interested in cultivating love and closeness in a way that supports individual growth. Therapists and counselors who seek an accessible resource for their clients, and for readers who wish to explore the most recent perspectives on relationship dynamics. Groups of people, whether religious or educational, who are concerned about the state of their relationships. People who are seeking to understand them and discover the promises of love and joy that being in life together can bring. Massimilla and Bud Harris are diplomates of the C.G. Jung Institute in Zurich and co-authors of Like Gold Through Fire. Bud Harris is also the author of several other publications including Resurrecting the Unicorn, The Father Quest, Sacred Selfishness, and The Fire and the Rose.